Savoy Cabbage Braised in White Wine, Thyme for Cooking easy gourmet sides. 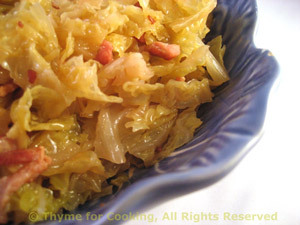 A bit of bacon adds flavor and color to cabbage. This is a traditional French recipe. Remove dark green outer leaves from cabbage. Cut off a thick slice, avoiding the core. Lay flat, cut into 3 or 4 wedges, then thinly slice the wedges. Sauté bacon in a medium skillet. When done, remove and drain. Add cabbage and stir-fry briefly. Add wine, cover and simmer over low heat for 15 minutes. Add vinegar and simmer for another 5 minutes. Crumble bacon and add to cabbage. Stir well and serve.